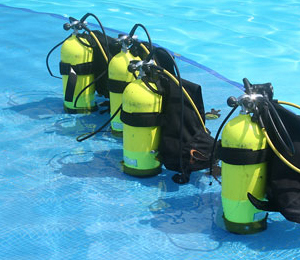 DAN certified oxygen providers are essential and necessary for diving excursions. A person who is properly trained to administer oxygen to potentially distressed divers can save lives. Oxygen-related dive injuries include near-drowning occurrences. This hinders the lung’s ability to transfer gases, possibly causing cardiac or respiratory arrest and diver panic. Another oxygen-related injury is decompression sickness, which is the absorption of nitrogen into the body’s tissue causing tears and slow blood-flow. Arterial gas embolism, the over-inflation of the lung, causing gas to enter into the bloodstream, is an oxygen-related diving injury as well. Finally, oxygen is used to prevent or treat hypoxia, which occurs when there is an insubstantial amount of the gas in the blood. Only medical, prescription-grade oxygen should be used for oxygen-related injuries. Too much oxygen introduced into the body is referred to as oxygen poisoning; proper administrating and equipment handling is essential. The equipment used by an oxygen provider consists of an oxygen delivery system, which includes a cylinder, regulator, oxygen mask and oxygen tubes and hoses. 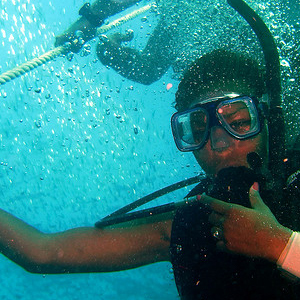 Before the commencement of a diving excursion, the oxygen provider should check the delivery system and pressure. While the unit should always be accessible and assembled at all times, it must remain off until it is needed. Having extra cylinders, washers and masks is also extremely important before embarking on a dive. Cleaning masks after every use and servicing equipment at least every two years is paramount to a clean and functioning oxygen unit. The acronym, DAN, stands for Divers Alert Network. 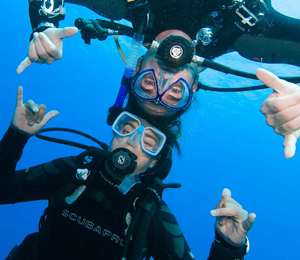 This non-profit organization administers professional and expert information regarding up-to-date medical procedures for divers. The network works to prevent underwater scuba diving accidents by training and certifying divers in the proper emergency procedures. DAN is also an advocate for underwater research and education, especially in regards to diving safety. DAN offers certification courses for oxygen providers. Upon the completion of the course an oxygen provider will be able to recognize the warning signs and symptoms associated with underwater diving afflictions. Furthermore, an oxygen provider will have knowledge regarding the advantage of administering oxygen to a wounded diver. Understanding the proper handling procedures of oxygen and the corresponding equipment is an essential aspect of the DAN certification course. Courses are offered onsite by a certified instructor or available online. An example of such can be found in the oxygen provider courses offered in Key West, Florida. Key West diving is a major element in the state, with many tourists, travelers and professional divers seeking to discover the state’s beautiful aquatic attractions.